Learn a few ways to quickly add new to-dos to Things while you’re working in other apps. Sometimes, when you’re replying to an email or browsing the web, you might think of something you want to jot down. Things makes it easy to do that before you forget, and without losing focus on what you’re doing. You can even automatically link to a website, email, or file, and capture snippets of text that you need to refer to later. Let’s have a look at how it works. On macOS Sierra, you can quickly and easily speak new to-dos with Siri. No matter what app you’re using on your Mac, you can use a keyboard shortcut to bring up the Quick Entry window, where you can enter a to-do and then quickly get back to work. Add a title and any other details to your new to-do. If you can’t reach Cancel or Save with the ⇥ Tab key, you’ll need to enable Full Keyboard Access. Alternatively, you can also use keyboard shortcuts to select a destination for your to-do, add a start date, or add a tag. On your Mac, open Things. In the menu bar at the top of your screen, click Things > Preferences. Click the Quick Entry tab. Click the field with the existing shortcut for Quick Entry. Press the key combination you’d like to use. It’s best to choose a combination that you’re not already using in other apps. No matter what app you’re using on your iPad, you can quickly and easily speak new to-dos with Siri. You can also create new to-dos that automatically include links and text from a variety of apps using the “Add to Things” extension. No matter what app you’re using on your iPhone, you can quickly speak new to-dos with Siri. If you have an iPhone 6s or later, you can force-touch the app icon and tap New To-Do to quickly open Things and enter a new to-do. Autofill enhances Quick Entry by automatically inserting links to webpages, emails, or files into your new to-do’s notes. To use Quick Entry with Autofill, you’ll first need to install a small Helper application from this page. While you’re in Safari, Mail, or Finder, press Ctrl + ⌥ Alt + Space. Your new to-do’s note will contain a link to the webpage, email, or file that you've selected. While we’ve designed Autofill to work best with Mail, Safari, and Finder, the feature may also work in other apps. The easiest way to find out if your favorite app supports Autofill is to try. If you don’t like the keyboard shortcut we’ve chosen for Quick Entry with Autofill on your Mac, it’s easy to change it to suit your preferences. Open Safari. In the toolbar at the top of the app, click the Share button. Turn Add to Things on. Things will now appear when you click the Share button in other apps. 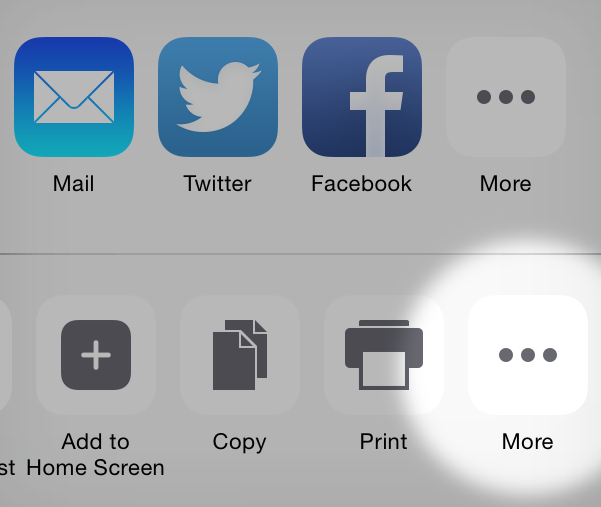 You can quickly create new to-dos that include links and text from many apps with the Share button. Open Safari. In the toolbar at the top-right of the screen, tap the Share button. Turn Add to Things on. Things will now appear in the bottom row of action extensions when you tap the Share button in other apps. While we’ve designed the “Add to Things” extension to work best with Safari, Contacts, the App Store, iBookstore, and iTunes Store, Maps, Notes, Podcasts, and Tips, the feature may also work in other apps. The easiest way to find out if your favorite app supports “Add to Things” is to try. Open Safari. In the toolbar at the bottom of the screen, tap the Share button. You can can also copy and paste a plain text list into Things to create new to-dos (one to-do per line of of text). On the Mac, just copy a list of text and paste it into Things via ⌘ Cmd + V.
On your iPad or iPhone, use the menu in any list to paste copied text from the clipboard.